We’re Kim Palmer and Annie Ridout, co-founders of Clementine. A few years ago, Kim was feeling bad. Her anxiety had rocketed and she wasn’t coping. Work presentations were becoming unbearable, even meetings were difficult. Meanwhile she had a young son, Louis, to look after. She needed to make some changes. She was introduced to Georgia Foster, an internationally renowned clinical hypnotherapist. Georgia’s soothing voice, positivity and practical tools completely changed Kim’s life. Things started to look up. She then realised she could help other women who felt like her (overwhelmed by the daily grind). And so she started developing Clementine: an app by women, for women who want to radiate confidence but are struggling with anxiety, low self-esteem or just feeling overwhelmed by life’s stresses. Kim brought Annie onboard and together, they’ve created an app that is clever, sharp and aesthetically on-point. 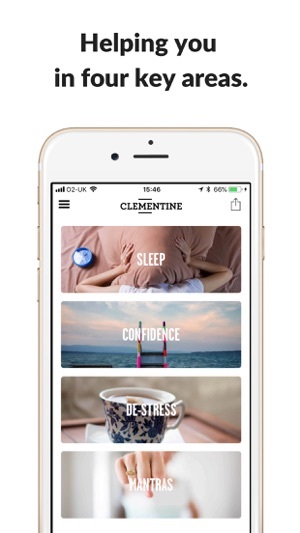 Clementine is not a spiritual, hippie app – it’s for the modern woman. And it works. It will help you to sleep better, feel calmer and be your best self. 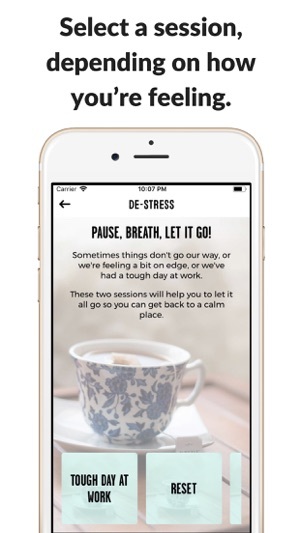 It includes a range of hypnotherapy sessions, as well as the option for daily mantras to pop up on your phone, giving you an instant boost. ● Use the five-minute ‘Confidence boost’ to start the day or before a big meeting. 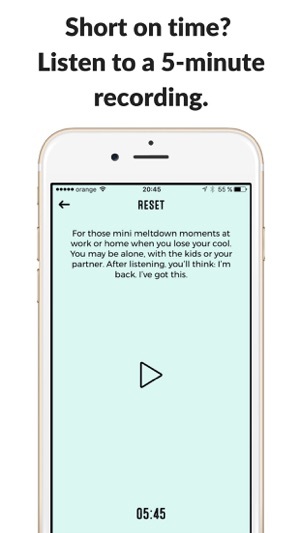 ● Try the five-minute ‘Reset’ when you’re on the brink of a mini meltdown at home or work. ● The 16-minute ‘Power nap’ will help you to catch up on sleep after a terrible night. We’ve made it really easy for you to give Clementine a whirl. Download the app FOR FREE (we made it free because we don’t want you to feel like there’s pressure to listen a certain amount, or learn a new habit in 30 days) and use it whenever and wherever you like. A while back, Kim one of the co-founders of Clementine, experienced a panic attack before an important meeting. She needed a way to get back on track really quickly and didn't have time to 'phone a friend'. She asked the women who follow us on Instagram about whether they too have moments of panic - and could find a 'panic button' feature in the app useful - and they said YES. So we've created one. Our resident hypnotherapist Georgia Foster has developed a really snappy (2-min) session, guiding you from 'panic' to 'calm' through breathing and visualisation. So when you're feeling out of control and vulnerable and need to quickly regain composure, this will get you there. And it's easily accessible from your Today screen (you don't have to go into the app). I’ll be honest: I don’t understand what the difference is between this hypnotherapy app and the meditation apps I have. I don’t know if the words being said are getting to a deeper level of my consciousness. And my ADHD brain is wandering constantly while I’m listening, so I don’t know that I’m hearing the words at all, as I’m not always properly focused on them. But I still really like it. I like Georgia’s voice. I like the positivity. This morning I woke up and didn’t want to get out of bed. So I listened to one of the longer ones, still tucked into my covers, and now I feel ready to face the day! Grateful for this app. Shocked that it is totally free. Wish that I could tip them or something. Hi there - thanks so much for taking the time to write this review. Reviews are so helpful to reach more women, so we are super grateful. Meditation and hypnotherapy are very similar- they both use suggestive techniques to try and encourage a new way of thinking. The big difference is that you can relax and sink into hypnotherapy. You could even fall asleep and the suggestive technique will still be accessing your brain. Alot of people with very busy brains therefore find hypnotherapy easier to access as you don't need to worry about following along with every single word. No need to tip us. We really want all women to enjoy the benefits of Clementine. We will work out how to make money from Clementine in other ways. So I searched some more and found Clementine and have really been enjoying it. I listen to the Start Your Day and Destress recordings throughout the day and my bf and I have fallen asleep to the sleep ones- some of the best nights sleep I’ve had in awhile. Can’t wait to see how y’all add and grow this app! What a pleasure to read about your experience of Clementine. This is music to our ears as we are on a mission to help women cope with the daily grind, sleep better, stress less and just feel better about ourselves. We will definitely be evolving Clementine - already this year we have added 4 new sessions and we have a new therapist who recorded the new 'relax your body' sleep session and she is about to record 3 new sessions. Plus there will be other new additions to the blog, podcast and more ways we can support you. Thanks so much for taking the time to write this review. It makes us very, very happy as we rely on women sharing the love. Kim, Co-Founder. Great way to start and end my day! I love this app! They have several categories of what meditations they offer and then they have several meditations to offer in different timed increments. I start my day with a confidence meditation and end it with a sleep meditation. I have definitely noticed a change in my overall affect. I have already recommended this app to several of my friends. This is great to hear. And thanks for sharing with your friends too. We'll be adding a few more sessions imminently so hopefully these will work for you too. Best, Kim - CEO.